It’s something like Elizabeth I and Mary, Queen of Scots, vying for the throne, but the setting is contemporary Bangladesh: Sheikh Hasina Wazed and Khaleda Zia are at loggerheads, duking it out for the country’s prime ministership. Each claims her original political legitimacy from a relative who was in office before she was, and neither is giving an inch in a prolonged dynastic battle for the soul of the country. Sheikh Hasina, the current prime minister, is the daughter of Mujibur Rahman, the (secular) Father of Bangladesh—the man who led his country to independence from Pakistan in December 1971 after a civil war in which the Pakistani Army resorted to the genocide of ethnic Bengalis. He was assassinated in a military coup in 1975, along with most of his family. (Hasina wasn’t killed because she happened to be in Germany on the day of the coup.) Khaleda, the leader of the opposition, is the wife of Ziaur Rahman, an army officer who was the country’s first military dictator. He was president from 1977 to 1981, before he, too, was assassinated. 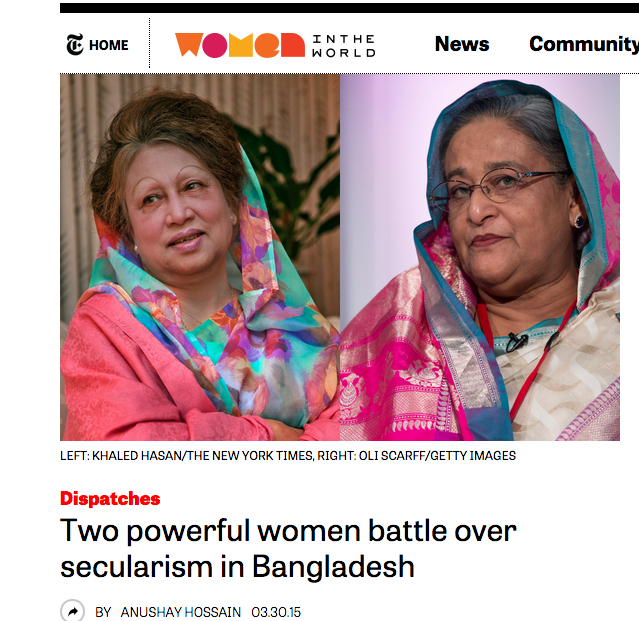 The prime ministerial score between the two women stands at two-all: Hasina, staunchly secular like her father, was PM once before; Khaleda, who draws support from the country’s Islamists, has been PM twice. Since 1991, when Khaleda first became prime minister, the office has largely swung back and forth between these two warring women. And the war goes on, with the two potent figures currently refusing to speak to each other. The country lies plunged in a sea of political violence that has paralyzed its potentially feisty and promising economy. This is a tragedy. Despite controversial elections, which Khaleda and her party boycotted, 2014 was a relatively calm year in one of the world’s few Muslim democracies. Even the garment sector, the country’s economic bloodline, managed to bounce back after sector-wide worker safety concerns and building collapses such as the Rana Plaza tragedy. Hasina had won acceptance by the international community after the diplomatic fallout over the “one-party” elections that brought her to power, traveling to New York for a UN General Assembly summit in addition to receiving various Heads of State in Dhaka, Bangladesh’s capital. The country’s stellar progress in curbing maternal mortality and promoting girls’ education continued. In this rare period of political calm, there was a fleeting moment when it appeared as though Bangladesh was well on its way to hauling itself out of poverty. But that possibility was set ablaze at the beginning of 2015. Khaleda’s opposition Bangladesh Nationalist Party (BNP) and 19 allied parties—including the religious extremist party Jamaat-e-Islami, which Hasina’s ruling Awami League had banned—unleashed a nationwide campaign of strikes and blockades on road, rail and river transport on January 5, the one-year anniversary of the polls they had boycotted. Prime Minister Hasina has responded to this mayhem by coming down hard, making sweeping arrests of key opposition figures, and labeling their actions as terrorism. And her mass political arrests and crackdown have been met with condemnation by human rights organizations and political opponents, globally as well as domestically. “What we are observing in Bangladesh is a combination of extortion, brutality and intentional disregard of law all under the pretext of a political arrest,” the son of a prominent politician, whose father has been arrested without charge several times, explains on condition of anonymity. International human rights organizations decry what they allege is the prime minister’s blatant disregard of human rights, and condemn Hasina’s offensive against those who want her to step down. Bangladesh’s volatile political landscape has long been dominated by the bitter rivalry between the two women. But Khaleda’s alliance with Jamaat-e-Islami, a terrorist organization that opposed Bangladesh’s independence from Pakistan—and took up arms against it—has raised the temperature to the point of conflagration. Hasina’s and Khaleda’s hatred for each other is no longer centered around a claim to the country’s most powerful political legacy: It has become a clash of ideologies that is tearing the country apart. In truth, both parties have blood on their hands. Even in Dhaka’s liberal elite circles, many agree that the prime minister’s autocratic responses toward dissidents are worrying, but they ask what options she has when the enemy is radical Islam. For any real and lasting solution to be reached, they say, the opposition BNP must cut ties with the Jamaat-e-Islami. In her fight to maintain secularism, Hasina finds herself on the same battlefield as Pakistan’s Benazir Bhutto, who also sought to take on the mullahs in her country and paid for that courage with her life. Bangladesh must protect her democracy and religious diversity, a responsibility that ultimately lies with the party in power. “As the leader of our nation, it is up to Sheikh Hasina to rescue the country from the jaws of defeat,” said Nusrat Rabbee, a faculty member in the department of Statistics at the University of California at Berkeley, both of whose parents were intellectuals targeted and killed by the Pakistan Army during Bangladesh’s war of independence. And that means fighting to prevent Bangladesh from becoming another Pakistan—the very country from which the Bengalis fought to free themselves more than four decades ago. *This article was also published in The New York Times/Women in the World. Finally I got a article common and really very important for me as i followed your blog for a long time. I couldn’t stop myself sharing this. In this crisis moment people like you who are in the most important position in the world have to come forward and raise your voice to help the Bangladeshi from the awkward situation. Life become hell.